CLEVELAND — Thousands of dead fish have been spotted this week floating along the Cuyahoga River. On Friday, wildlife officials say this alarming sight shouldn't be a cause for concern. A viewer told News 5 he spotted numerous dead fish on the Cuyahoga River in the Flats East Bank earlier this week. Fish Hatchery Program Administrator for The Ohio Department of Natural Resources Kevin Kayle said the sight of thousands of dead fish along the river shouldn't be a cause for concern as this large number of dead fish is not related to any pollution event. The dead fish were identified as gizzard shad— a bait for other large predatory fish—and they are abundant along the shores of Lake Erie, harbors and lower rivers during late fall through early spring, according to Kayle. Like many Clevelanders, they don’t handle the cold weather well, as they are on the northern end of their geographical range. Winterkills, known as winter die-offs of fish, are caused when persistent ice forms a surface barrier between water and air that prevents circulation of oxygen and blocks sunlight. Because of the weather, they are typically known to die off in large numbers. The red areas seen on the outside of the fish are related to abrasions and bacterial, fungal and/or viral outbreaks as they decompose. Like gizzards, other species that commonly die off after the winter months are resilient and come back in large numbers the following spawning season. Concerned citizens should not try to rescue stressed or dead fish because handling stressed fish significantly reduces their chance of survival, according to ODNR. 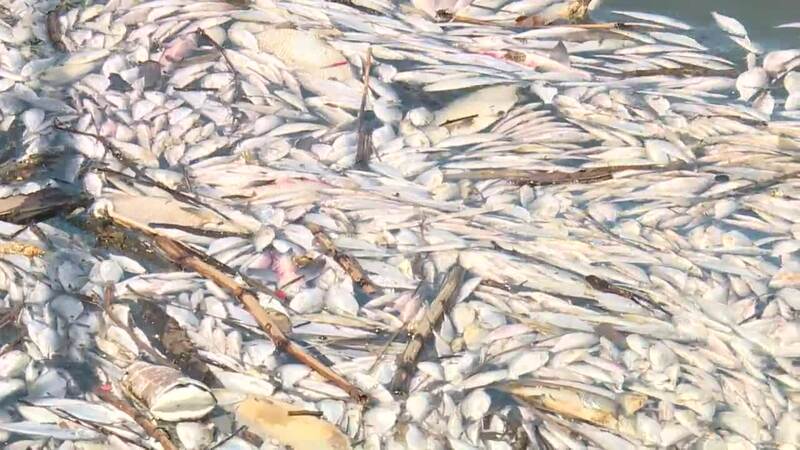 Large numbers of dead fish should be reported by calling 800-945-3543.